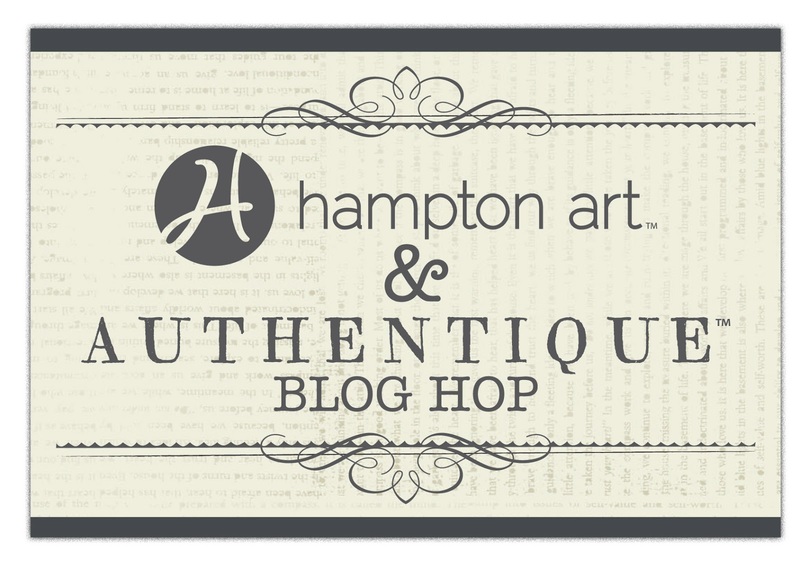 Authentique Paper and Hampton Art are teaming up over the next couple of days to bring you tons of inspiration using Authentique Paper and our new stamps from Hampton Art! 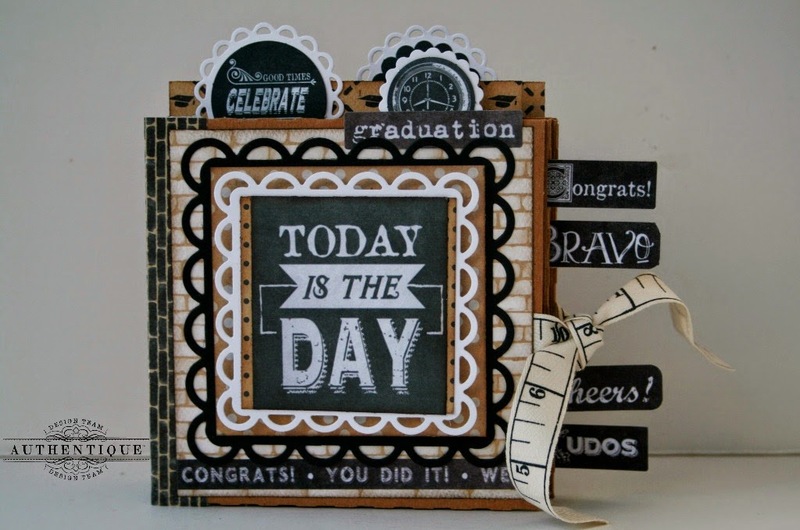 After you check out the projects here on the Authentique Paper blog, be sure to head on over to the Hampton Art blog to find out what the talented members of their Design Team have created today with these stamp sets and Authentique Paper products! I paper pieced the images to use as an accent to the top of my page..
then taking some of the 12 x 12 papers and layering them on top of each other for a layered look. The flowers from Petaloo added the perfect accent for these papers.. I just love the blues and yellows. favourite.. I used the sticker letters and words to add my title . For today's project, I decided to use an embossing resist technique and both the Hampton Art Cling Stamps, and ColorBox Dye Inks. I started with a plain white piece of cardstock, then wiped the cardstock with a used dryer sheet. This helps the embossing powder to only stick to the areas that I want it to. I took my Hampton Art Cling Stamps and some Versamark, stamping first my sentiment (Footloose), then the flower images (Grateful Heart) repeatedly. I then used clear embossing powder, and heat embossed the images. Now comes the fun part! Using any of the ColorBox Archival Dye Inkpads, mix up a few colors by taking a sponge or other porous material to dab, swirl and blend colors. 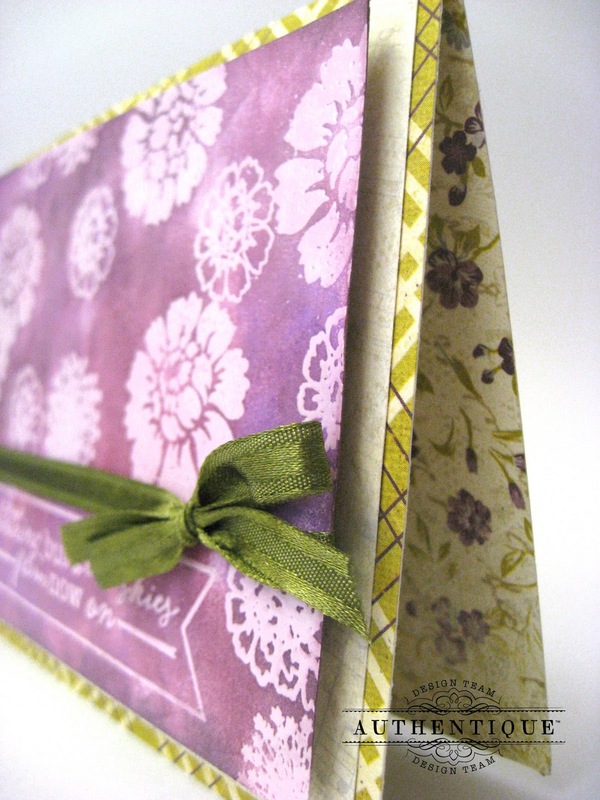 On this card, I used a combination of Gooseberry, Dark Cherry and Frosted Plum. After I felt that I had mixed the colors to the tones I liked, I used a damp cloth to rub off the inks from the embossed areas. Don't rub too hard, or you may take some of the paper with you. 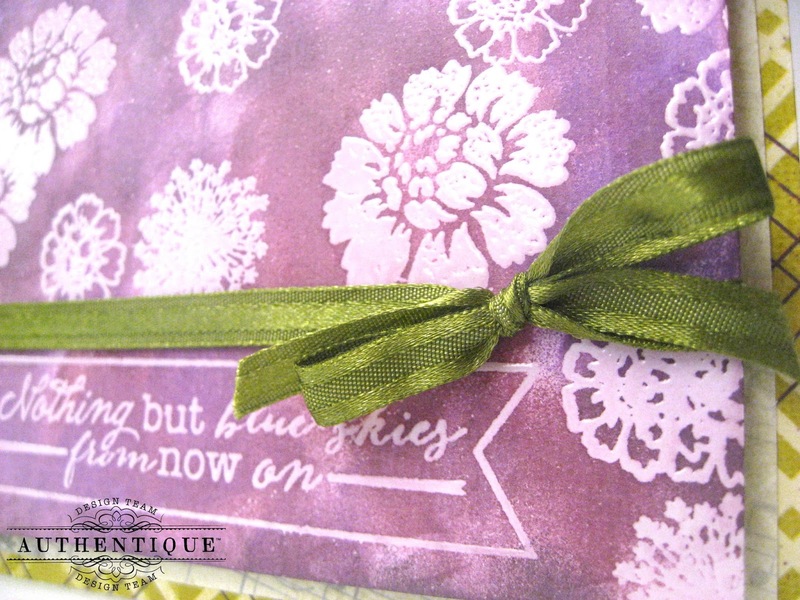 Once it was completely dry, I cut some chipboard to make the embossed section more dimensional, added a contrasting May Arts ribbon, and layered my newly designed sentiment on some of the papers from the Remembrance Collection. 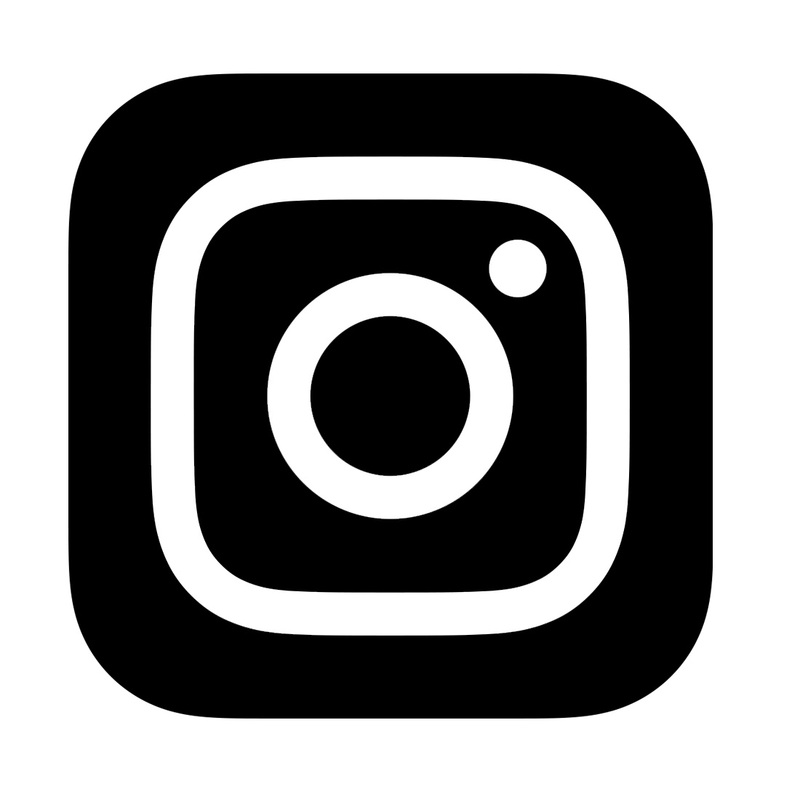 Also, make sure you stop and visit us as well as our friends over at Hampton Art all week long for prizes and lots of wonderful inspiration coming your way! Don't forget to stop by the Hampton Art Facebook Page and tell them Authentique Paper sent you! 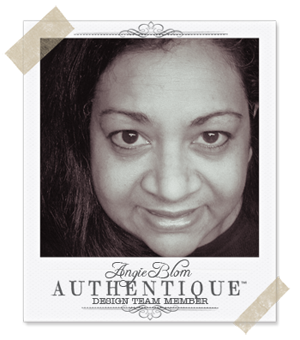 Love Angie's layout! I really like how she used the stamps! Heather's resist card is fabulous! 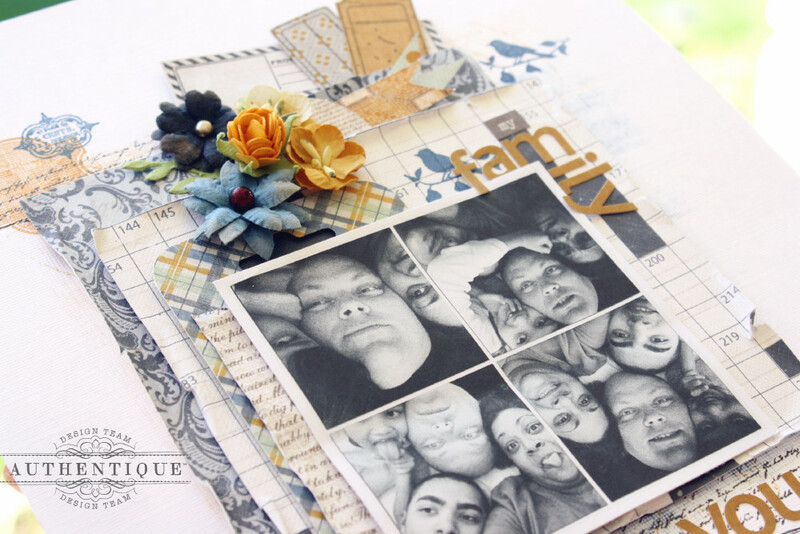 Love that sentiment stamp. Beautiful projects! Love the stamping on the first one and the cluster of elements up top, and the card technique is gorgeous! I love the LO! Fabulous card! these are both awesome, thanks for sharing! two great projects-love the layout with the crossword paper, and the resist technique looks terrific! Great projects today. 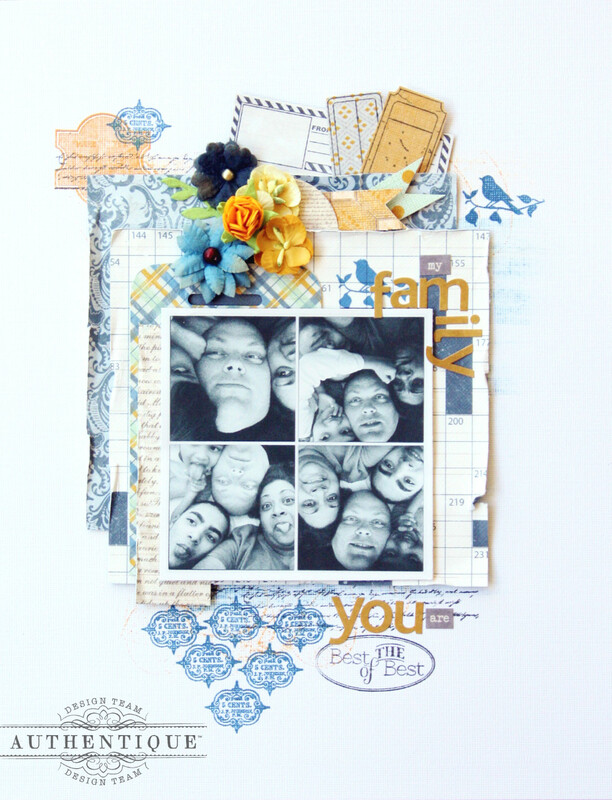 Loved the layout and all the wondeful layers from stamps to papers. The flowers just make the whole design pop. great job. The card is beautiful with those wonderful colors. 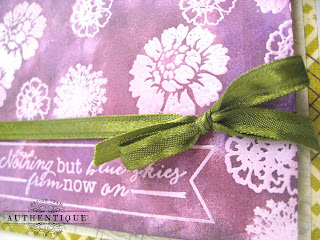 Love the resist technique and great tutorial on making the card. The colors are so pretty on both projects. Love the purple card. I think that's my favorite color after blue. 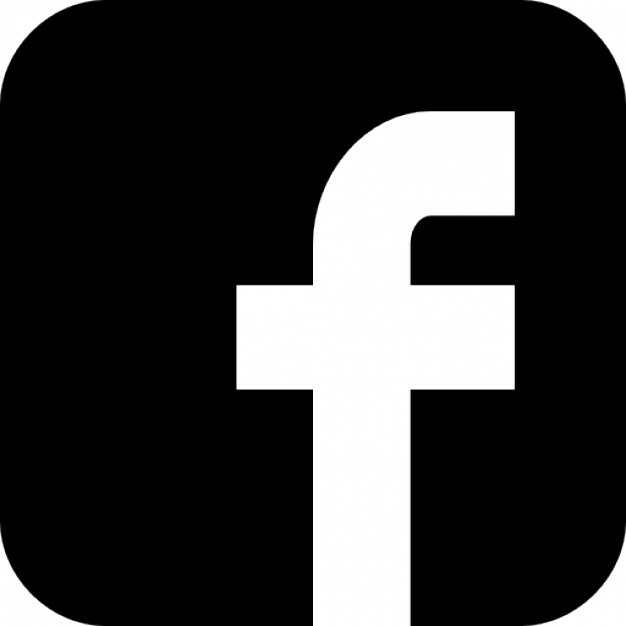 Truly awesome projects! I love the elegant feel to them. oh... such pretty projects. Loving the purple on the card. 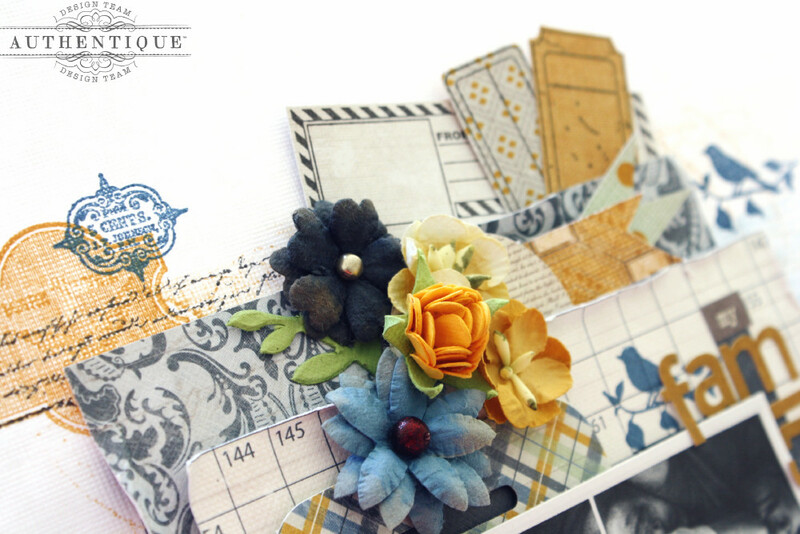 2 different unique projects.. i love the layout, layers and the flowers.. The pattern paper mix is very intriguing..
dryer sheet is a nice idea.. I dont have a embossing buddy.. So this fits perfectly for me.. The tickets on the top of Angie's is really great. They go well with the flowers---she tries new things that I always like. The blues and oranges look nice together. It's a nice combination. love all of the layering on Angies LO! Great layout. Love those flowers and tags at the top. Beautiful card, crazy for the green and purple combo. 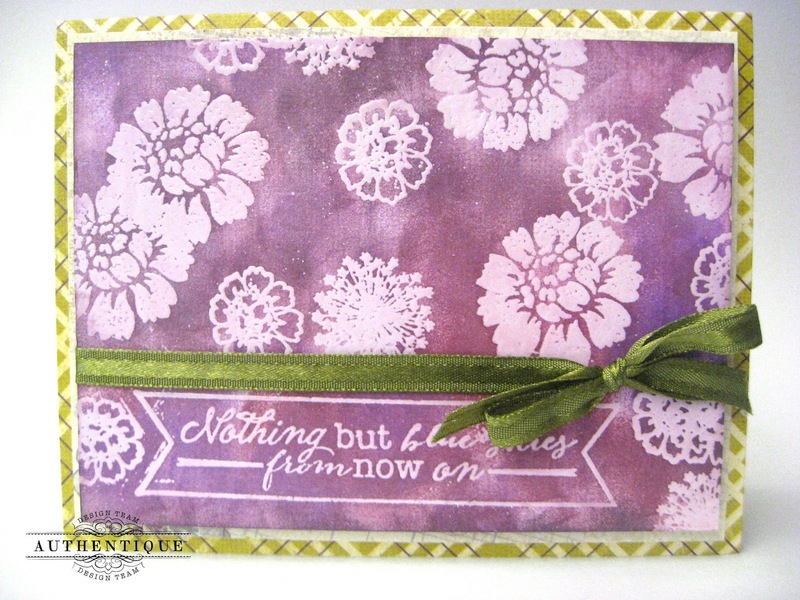 Great layers and flowers on the first project and lovely card. 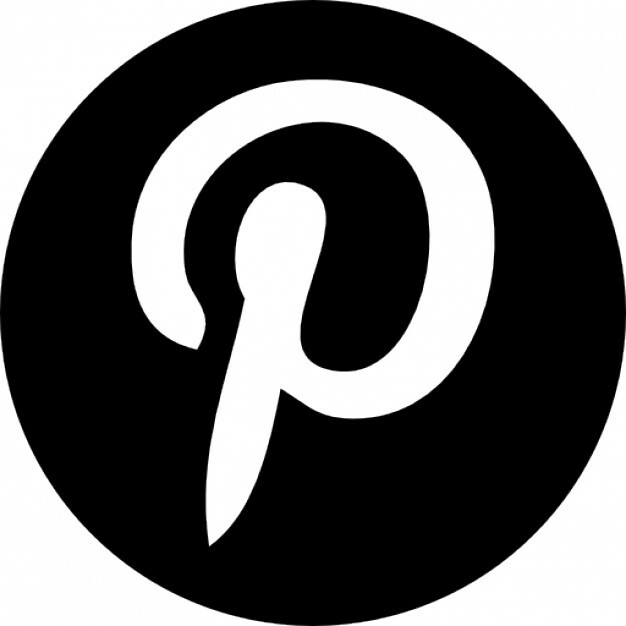 Pretty projects, thanks for sharing these ideas. beautiful layout and card ! Love the blues and tans/golds. Angie I love the colors and the way you choose to use the stamps...awesome layout! And Heather stunning card the colors are fabulous! 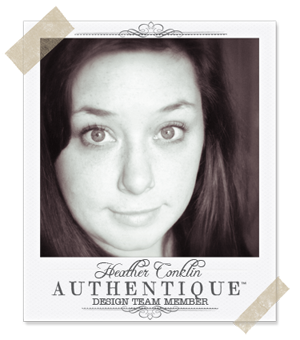 Absolutely gorgeous card Heather! I have never tried this resist technique, but I am dying to try it! Thanks to all of your helpful tips, I feel like I might even be able to do it :) I love the color you mixed and that sentiment is perfect! Love the patterned inside too! Thanks for sharing your creative talents! That LO is amazing! I really like the cluster of tickets at the top. Heather's card is wonderful as well. I love how she completely focused on the stamping. I'm a card maker so I am naturally drawn to them! Love today's. I love the sentiment, Nothing But Blue Skies from Now On. It gives hope and a feeling of calm!!! 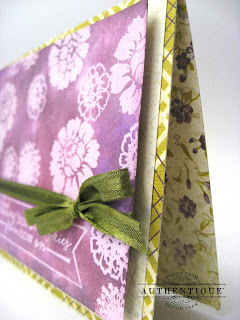 Angie, I like how you blended the colors of the papers and flowers with the stamps for your page. It turned out great. Pretty layout and card! Love the color combo and pretty flowers on the layout! Beautiful resist technique on the card! Fantastic page! Love all the layers! Beautiful card!